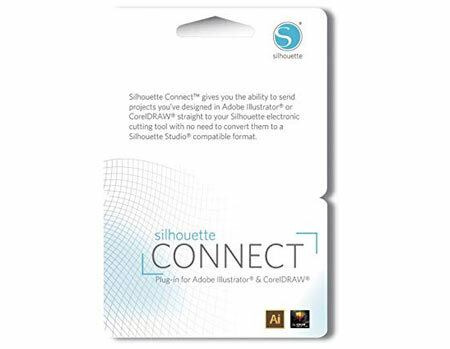 Silhouette Connect™ allows you to design a project in either Adobe Illustrator® or CorelDRAW® and send it to your Silhouette. You're able to add registration marks for print & cut projects and adjust the cut settings for different material types. You're also able to cut by individual layer or line color, so you can easily alternate between different blade/pen settings. SILHOUETTE CONNECT™ VERSION 1.0.241 (RELEASED 1/10/2014) Compatible with Windows XP and higher, Mac® OS X 10.6.8 and higher. Requires either Adobe Illustrator CS4 or higher or CorelDRAW X4 or higher (Full version only - does not support "Home and Student" edition). Compatible with original Silhouette, Silhouette SD, Silhouette CAMEO®, and Silhouette Portrait® electronic cutting tools. This is the newest version of the Silhouette Connect™ plug-in. If you have an older version of the plug-in, installing this version will simply ensure that you have all the latest updates.